By Sia in Desktop. Updated on December 9, 2017 . Google has been steadily rolling out a new "Material Design" look for many of its services, ranging from Chrome OS all the way to YouTube. Chrome itself will also be getting some Material Design-based overhauls in the coming feature, although some of these overhauls, such as the one affecting Chrome’s Extensions tab, can be enabled right this instant. Open up Chrome and type "chrome://flags/#enable-md-extensions" into the address bar . On the highlighted option, choose the "Enabled" option. Once done, restart the Chrome browser. If done properly, your Extensions tab will now look drastically different from the pre-existing one. Where the old Extensions tab lists down all of your active Extensions from top to bottom, the new Extensions tab would arrange all of them in a grid-like arrangement. With this arrangement, you can potentially see all of your Extensions without needing to scroll down any further. 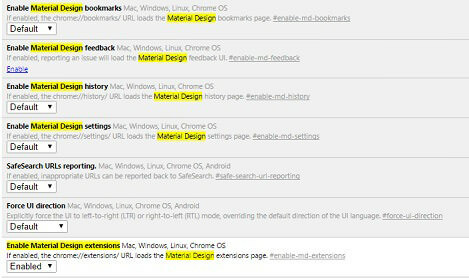 For those who are a tad bit more curious, Material Design can also be enabled for various other parts of Chrome on the flags page should you wish to do so.